Every season offers a unique experience for the visitor. 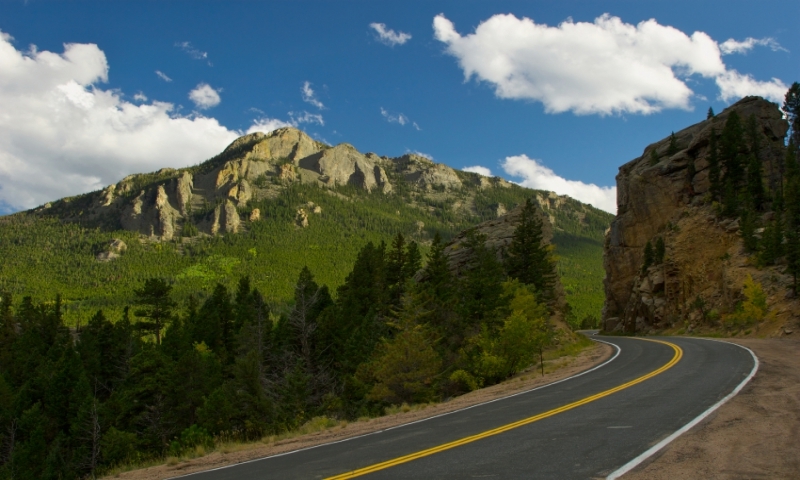 Central Colorado's Rocky Mountain National Park is filled with year-round recreation. From summer hiking to winter cross-country skiing, you'll find fun and excitement no matter what time of the year you come. Here are some highlights for the different seasons. Bear in mind that seasons in the highlands often differ than lower elevations, with spring coming later, summer being shorter and cold weather coming earlier. Seasonal Highlights – As the days become longer and warmer, mountaineering season comes into its own. Whether you seek traditional mountaineering, ice climbing, ski descents or mixed climbs, you'll find that Rocky Mountain National Park, with a plethora of large, rugged peaks to ascend, certainly has more than its fair share of options. While many destinations may require lengthier approaches, especially with seasonal road closures, routes such as the Dragon's Tongue offer short approaches and classic lines. In April, Old Fall River Road and Trail Ridge Road open to bicycles only, making it the perfect time to take a bike tour through the park without worrying about car traffic. Seasonal Closures –Old Fall River Road will likely be closed through the spring. Trail Ridge Road is also usually closed between Many Parks Curve and Colorado River Trailhead until Memorial Day. The Colorado River is closed for 300 yards on either shore until mid-March to protect bald eagle habitat. Lumpy Ridge and Sheep Mountain also have area closures through much of the spring. From May 1 to August 1, the Specimen Mountain Trail is closed to protect Bighorn Sheep. Crowds – Visitor numbers are low during much of the spring, with April being one of the less-busy months of the year. March has slightly more visitors, and May sees the start of the summer crowds. Seasonal Closures – Old Fall River Road usually opens around the first week of July, although it may close when weather and conditions worsen. Trail Ridge Road usually opens by Memorial Day. From May 1 to August 1, the Specimen Mountain Trail is closed to protect Bighorn Sheep. Crowds – The beautiful summer weather in Rocky Mountain National Park brings the people flocking. July and August have the highest visitor numbers, with June not too far behind. May tends to be less busy, but snow may still cover the ground in many places. Seasonal Highlights – Fall is a beautiful time in the mountains. Changing leaves provide a patchwork quilt of color covering the park, and snow-dusted peaks provide a stunning contrast to the drier land and fall colors below them. Shorter days, colder temperatures and inclement weather make climbing and mountaineering more challenging, although still feasible. The colors and temperatures are perfect for a horseback ride through the park, and rolling out of a sleeping bag into crisp, fall air is a treat everyone can appreciate. The rut, mating season for elk, also comes during the fall, starting sometime in late August and lasting through September or October. During this time, elk come down to lower-elevation meadows to compete for mates, where the sounds of bugling and sights of bull elk displaying for females is a yearly favorite for visitors. Seasonal Closures – Expect Fall River Road and Trail Ridge Road to be closed for weather intermittently during the fall. Fall River Road usually closes for the winter around the beginning of October, with Trail Ridge Road closing a few weeks later around Columbus Day. The Colorado River is closed for 300 yards on either shore from mid-November until mid-March to protect bald eagle habitat. Areas in Horseshoe Park, Moraine Park, Upper Beaver Meadows and Kawuneeche Valley are closed from August 30 until October 25 to protect elk during rutting season. Crowds – Crowds thin out as summer ends and fall begins. While lower than peak summer months, September still has relatively high visitor numbers. Visitors drop significantly during October and more so in November. Seasonal Highlights – As winter blankets the Park with snow and waterfalls turn into chandeliers of ice, snowshoeing and cross-country skiing take over, along with ice climbing. Sledding at Hidden Valley is a popular pastime for young and old alike, and snowmobiling along the North Supply Access Trail gives a faster-paced option for the adrenaline-minded. Backcountry skiing and snowboarding is also popular in the park. Seasonal Closures – Fall River Road will be closed from the Endovalley parking lot. Trail Ridge Road will be closed from Many Parks Curve to the Colorado River Trailhead. The Colorado River is closed for 300 yards on either shore from mid-November until mid-March to protect bald eagle habitat. Crowds – Crowds in the winter are the lowest of the entire year, especially in December. For those willing to get away from the roads, the park will provide a wintery solitude harder to find during the rest of the year.